Now, gut microbiota are even rearing their heads in popular entertainment. In recent years, scientists and laymen alike have been turning to the microbiome with renewed interest to explore its interaction with human disease. Now, gut microbiota are even rearing their heads in popular entertainment. Films and television shows often tap into the public and political subconscious, and this is especially true for 2018’s films like "The Favourite", "A Star is Born", "Can You Ever Forgive Me?" and television drama "The Terror", whose psychologically unstable characters struggle with food or alcohol-related illnesses. 2018’s hit films "A Star is Born and Can You Ever Forgive Me?" depict figures who were once prominent artists in their fields (a pop musician, a writer) whose loss of stardom sends them into a depressive state that is worsened by alcohol abuse. This year’s award show darling "The Favourite", isn’t about the gut microbiome or food-related illness per se, but does curiously set aside time in the narrative to show the queen vomiting, or suffering from an episode of gout, a disease known to affect 17thcentury Queen Anne of England among other past royal figures who indulged in rich food and drink. Back in 2010, Harvard Medical School published a health letter to this effect, titled “More on gout: Once kingly, now common.” Eating like a king can be a way for someone to flaunt their wealth, and the disease has made a comeback in the 21stcentury as more people can afford ‘luxury’ food items. The AMC limited series "The Terror", similarly centers around English noblemen and their indigestion: on the ill-fated Franklin Expedition from 1845-1848, findings suggest that the officers and later crewmen consumed lead-contaminated water and tinned food (the latter then considered a luxury item). Of all of these cinematic works, perhaps "The Terror" is the most psychologically fascinating, for the “insidious indigestion of lead” is said to have weakened both mind and body, making the ship’s crew members more susceptible to diseases such as tuberculosis, pneumonia, and scurvy. In the show, psychosomatic symptoms like paranoia and hallucination become the main act, the ‘terror’ that engulfs the crew – remember that these men sailed for three miserable years looking for a passage through the Canadian Arctic. Extensive research has shown that microbes that inhabit the gastrointestinal tract—or gut microbiota—are involved not only in both nutritive and digestive activities but also in immunological processes. […] It has been noted that gastrointestinal bacteria have influence on behavioral and cognitive processes. 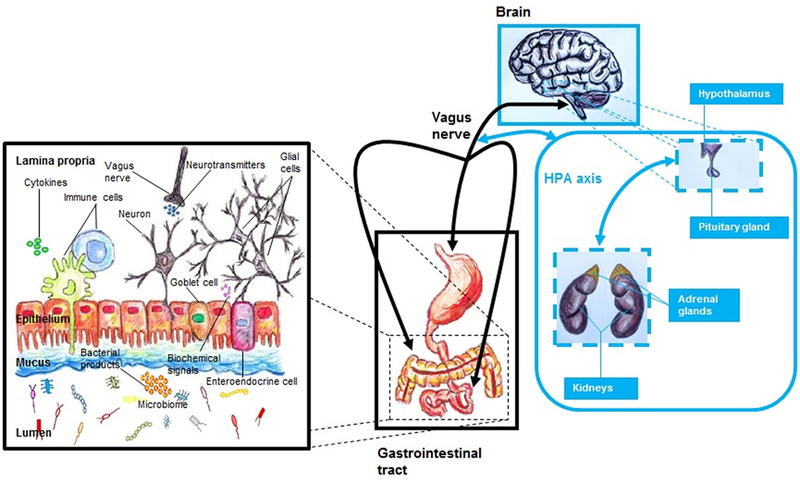 The point at which the gut and the central nervous system (CNS) intersect is known in the scientific community as the gut-brain-axis. Since the gut microbiome may influence the CNS, researchers like Lima-Ojeda et al., among others, propose to include the microbiome as part of this axis, i.e. the microbiota-gut-brain axis (MGB). As cited in the article, previous research already points to the gut microbiome’s ability to “modulate the function of limbic system…including regions such as amygdala and hypothalamus…. Emotional stress appears to impact gut microbiome composition… [and] the pathophysiology of neuropsychiatric disorders” such as depression, schizophrenia, anxiety, and autism, appears to involve gut microbiome changes. As the authors of the article point out in their conclusion, the question of human being’s relationship to food has been preoccupying intellectuals long before Hollywood: The ancient Greek physician Hippocrates expressed this idea by his maxim: “Let food be thy medicine, and medicine be thy food”. After centuries of scientific advances, the idea that what we eat affects our mental wellbeing remains sound. But if you find it tedious to sift through the latest research in microbiome research, take a lesson from the tortured souls of 2018’s film and television hits and eat well in 2019! Cara Koehler, M.A., holds degrees from DePaul University, Chicago (USA) and the University of Bamberg (Germany), where she is currently a doctoral candidate. She also works as a freelance German to English translator and English-language copyeditor. Mandatory field Security question* Please add 1 and 4. Mandatory field Security question* Please add 2 and 9.